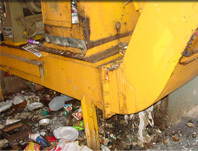 Do you have a trash chute or compactor repair problem that needs to get resolved RIGHT NOW? Between 8:30am and 4:00pm PT, Monday through Friday, please use the Doctor’s live chat or call 800-755-CHUTE, toll-free. After hours, please use this form for immediate response from one of our on-call technicians. We service and repair trash, recycling and laundry chutes, chute-fed compactors, and odor control systems in Los Angeles, Orange County, San Diego, Central California, and Arizona. There is a two-hour minimum plus travel charges outside of a specific travel radius from our nearest service center to you. 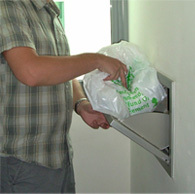 The charges for this are portal-to-portal plus time and resources required once the technician arrives on site. Our rates for Emergency Services are $198.00 per hour for Overtime and $237.00 per hour for Double Time. For a reduced rate during regular business hours on our next business day see our Time and Material Repair Order. The initial charge of $396.00 will be credited to the final invoice. Visa, MasterCard and American Express are accepted. Our emergency chute and compactor repair service is for after-hours response to urgent situations. Our technicians can troubleshoot chute blockages, broken doors, odor control systems, compactors, and more. We consider any service appointments between 3:30 pm and 7:00 am Pacific Time to be after-hours. For service during business hours, please use the Doctor’s live chat or call us toll-free at 800-755-CHUTE for the quickest response. When possible, we can schedule a next-day visit at a reduced rate. Get the repairs done quickly and correctly. The Chute Doctor's technicians are uniformed chute repair specialists, professionally trained, and bonded.